For a baby gift for my sister's I made them both car seat canopies for my new nieces. They both live in the bright sunny desert and I knew this would be perfect to keep the sun out of their little one's eyes. I made one for El and it was great for when you don't want strangers touching your baby, you just say, "oh sorry, the baby's asleep." I made this particular one for my sister's friend. 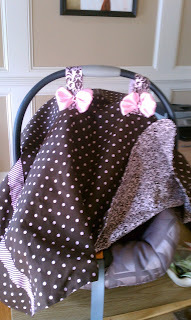 It is reversible and has removable bows for washing.